Library visitors enter from the building’s 17-foot-high lobby into the 92,000-square-foot facility, which occupies portions of the first floor, concourse and entire second floor. Combining print and high-tech media, it offers open shelving for more than 250,000 periodicals and monographs, over 500 work stations which are wired to support lap-top and desk-top computers, and fully equipped state of the art electronic training rooms. The library also offers group study areas, miscellaneous special collection rooms, dissertation archives and a media library complete with music listening stations. In its previous quarters, the library was in the basement. Now library users have the luxury of sitting next to 12-foot-high windows that look out onto Fifth Avenue, Madison Avenue, and 35th Street. 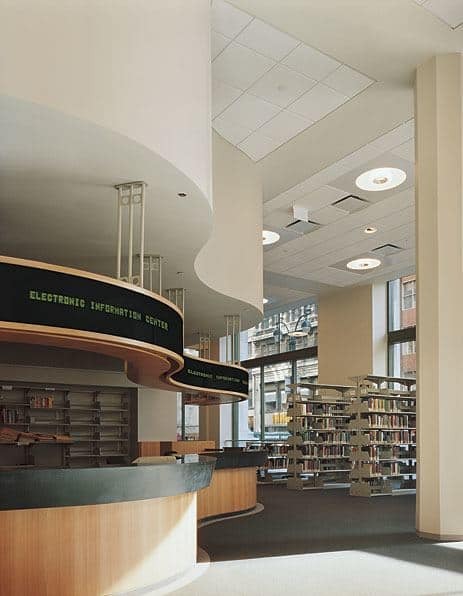 The facility’s high-tech capabilities are announced at the library reference desks with LED signage strips running along the edge of the desk canopies. Flexibility is key throughout the facility, typified by the workstations’ adjustable perforated dividers, which provide lateral flexibility, create a discrete territory and are handicapped accessible. Cabling in the walls and floor are easily accessible for upgrades. Sight lines extend down the length of the library, allowing easy supervision by library staff. One special part of the library design was the reclaiming of select historic interior elements. The most visible result was the restoration and replication of one of the original stairs and elevators as the main circulation between the library’s three floors. Opposite the entrance to the library is the cultural complex that includes three theaters, an art gallery, a bookstore, a coffee bar, and television production facilities. Academic and research areas, located on the middle five floors, include classrooms, lecture halls, computer labs, faculty and student offices and study areas. The top floors house administrative offices, a skylit conference room and a conference center, organized around the central dining commons.